The insurance industry, struck by increasing environmental hazard claims, rising disability and liability claims, and lost investment income, has raised premiums across all lines of coverage in recent years. And, like other businesses, physician practices are feeling the financial pinch with increases in health, disability, and property insurances, as well as skyrocketing increases in liability coverage. In an economic climate threatened by decreasing revenues and yet another set of Medicare cuts, some physicians have decided to forego insurance in some areas and “go bare.” Hard data on this phenomenon is not readily available, but anecdotal reports by industry sources, as well as physicians, suggest there is reason to focus on this rising practice expense area. Indeed, in one electronic listserv, a neurologist wrote in that that he had been invited to a meeting on “protecting one's assets if one is considering going ‘bare.’” In less than 24 hours, the venue was sold out. He noted that many specialists in his area in South Florida carry no insurance. For those of us who feel this is a risk too high to undertake, it is important to engage in a careful analysis of insurance costs and perform a comprehensive review of current policies in order to make judicious decisions. Beware, in addition to higher rates, new and tougher terms are also being imposed on policies and when claims are sought – and it can be much more difficult to collect. Increases in claims by physicians – especially stress-related disability claims – have been steadily rising in recent years. Insurance companies, faced with high pay-outs and increasing numbers of claims, have been issuing more denials. Those that end up in law suits are often settled and plaintiffs are bound by confidentiality agreements that prohibit disclosure of the details and amounts of settlements, making this a subject not widely discussed – and a difficult one on which to obtain hard data. However, Rhonda D. Orin, an attorney who specializes in suing insurance companies on behalf of policyholders, reports that she has received an increasing number of calls from physicians being denied disability claims in recent years. This columnist attempted to get more specific data on claims by physicians and neurologists, and was told by several sources – the Medical Group Management Association, the Employee Benefits Research Institute, and the American Medical Association (AMA), among others – that the standard gag clause prohibits claimants from disclosing details of their settled disability claims. But several neurologists volunteered to share their experiences – though insisting on anonymity due to their settlement agreements. One neurologist sought – and was turned down for – disability benefits after he had had cognitive difficulties following surgery for a cardiac condition. Ms. Orin warned that one of the clauses that causes the most difficulty is the own occupational coverage clause, known as “own occ.” In current policies, own occ coverage is often limited to two years; after that time, insurance companies will try to argue that physicians are not disabled if they can hold any job – even flipping burgers. She said that it is important to describe your occupation accurately when completing a disability insurance application. She advised that if you define your role as “a neurologist and practice manager,” the insurance company might try to create trouble for you. For example, the insurance company may allege that the physician can still function in an administrative capacity as a “practice manager” (even if there is no practice to administrate). In fact, this occurred with a dentist several years ago. Berkshire Life refused him full benefits because they claimed he could still do administrative work. If you are looking to reduce costs, ask about discounts for non-smokers, membership in medical societies, multiple policies, and employer-sponsored plans. Consider whether your savings or assets will allow a six- to twelve-month (rather than standard three-month) elimination period, which substantially lowers rates. The elimination period is defined as the time disabled until you can start claiming benefits. This should be as long as your assets will comfortably allow. For example, if you are disabled 12 months with a three-month elimination period, you can collect benefits for nine months. Peter Headley, President of the American Medical Association Insurance Agency, advises physicians to purchase disability insurance as early as possible. “It is always better to apply early, when you are healthy,” he said. Two other related insurance products include business overhead insurance, designed to reimburse a business owner's overhead expenses (such as accounting expenses, utilities, mortgage or rent, salaries, equipment loans, property taxes, advertising, and premiums for business insurance) while disabled, and disability buyout insurance, which provides funds to back a disability buyout agreement. Many physicians have discovered that buyout insurance has become harder to collect. After having paid premiums for this type of policy for many years, while premium costs remained high, the valuation of the practice – the foundation for benefits – had gone down substantially. “This is a lag area – the valuation can reflect the current market value, which may be considerably less that the original market value from years ago,” Ms. Orin said. Premiums for property and casualty insurance also rose in the past year – an average of up to 30 percent, but as high as 100 percent in predominantly urban areas. Data released in the third quarter of 2002 by the Council of Insurance Agents and Brokers showed premium rises across all lines of commercial policies, and it is anticipated that property and casualty premiums will continue to increase in 2003. Perhaps even more ominous is the apprehension expressed by 86 percent of respondents regarding carrier solvency. Responding to a question on emerging issues, brokers cited the economy's continuing weakness and post- 9/11 carrier rating declines as the reasons for growing fears of insolvency. In a survey, brokers reported that customers were dealing with higher premiums by dramatically altering their choices. Higher deductibles were being sought across the board, 59 percent of respondents said that customers were self-insuring a portion of the risks, and 51 percent said some clients had foregone insurance totally for risks previously managed with commercial insurance coverage. Last month's “In Practice” column discussed the escalating costs of professional liability insurance. However, many insurers still offer discount opportunities. If you have a good loss history, you may be able to negotiate a claims-free discount with some carriers. If you attend a risk management educational program, use an electronic medical record, are a member of a qualifying medical society, or spend part of your time teaching, you may also be eligible for a premium credit. Recent graduates, part-time practitioners, and retired physicians may also qualify for reduced coverage. If you are self-employed, make sure disability pay-outs are not taxable – don't deduct coverage as a business expense. Try to get policies that are non-cancelable; premiums are guaranteed to remain fixed even if the policyholder's health deteriorates. Look for guaranteed renewable disability – this protects against the insurer adding restrictions at a later time, but allows the company to raise premiums. Check to see if there is a cap on maximum benefits or if benefits are capped to age 65. Check your policy with a rating service, such as Moody's, to evaluate the insurer's financial status. Do you have a practice management issue you would like to see covered in Neurology Today? 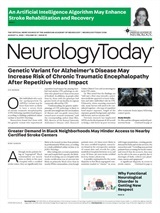 Please forward your suggestions to neurotoday@lww.com.